August 13th: fair. We leave Niagara Falls and ride west on the north side of Lake Erie. It's windy and dry, probably due to this level land. A long straight stretch of road connects to another like a tent pole, and it takes much caution to let fast cars pass us by on a gravel-shouldered two-laner. Soon the afternoon sun begins dazzling our eyes, so we turn south to a campground by the lake. Though it's the smallest of the five Great Lakes, Erie appears as large as a sea. August 14th: clear. We ride and ride westward. Strong side winds push our bikes right and left, and like a pair of carp we open throttles against the flow. We get off our bikes in a town a few hours east of the border, and find the wind swaying in our bodies like waves do in sailors' on shore. 15th: cloudy. The ferry to Ohio is sold out, so we take the land route into the USA. We ride through Detroit toward Ann Arbor, home of the University of Michigan where a friend of mine is enrolled in a summer program. Here the trees by the road have widespread branches, and prominent among them are these ones with deep purple leaves, perhaps a kind of maple called the Crimson King. 16th: pleasantly overcast. We leave Michigan and cut through Ohio's northwestern corner into Indiana. We cross a state border after another, but the farm-and-ranch scenery remains the same. In a roadside pen are rows of kennel-like houses where calves sleep. A little unleashed dog darts out chasing us into the road. As we pass an Amish carriage, the kids in the back smile shyly and wave to us. 17th: sunny. 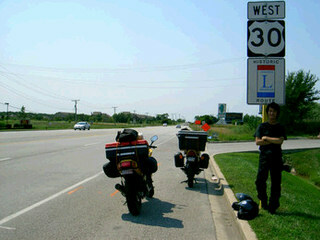 We get on Lincoln Highway, the first road across the USA, into Illinois. We then switch roads, and ride southwest along the broad Illinois River which takes us to the city of Peoria. As of tonight we're in the area near Lake Erie's westernmost end, on the Canadian side. We'll take a ferry to Ohio tomorrow morning as it's going to take us a bit longer to ride through Detroit. We couldn't hop on the morning ferry perhaps because I didn't tell the operator on the phone that we were on bikes. So we came through Detroit to Ann Arbor, home of U of Michigan. If I'm not mistaken, Joseph Brodsky once taught here as a guest professor. Choosing college towns for your stops is a good idea when traveling in areas you don't know well. It's safe and also convenient for shopping. We took a tiny bite of Ohio's northwestern corner, and came to Indiana. But the landscape seems to stay the same. We did set our foot on Ohio but didn't have time to visit major cities like Cleveland or Cincinnati. It's pretty muggy in basin-like areas here in the Midwest, but I hear it's brutally hot in Japan.